Thomas Meighan was born April 9, 1879, in Pittsburgh Pennsylvania. His father was the president of Pittsburgh Facing Mills, so his family was well-to-do. He attended St. mary's College studying pharmacology but quit after three years to pursue an acting career. He started out in the Pittsburgh Stock Company in 1896 and by 1900 he made his first appearance on Broadway. The next several years saw a successful career on Broadway, and sometime around 1907-08 he met and married Frances Ring. In 1914, he appeared in his first film -- "Dandy Donovan, the Gentleman Cracksman" which was filmed in England. This led to a contract with Famous-Players Lasky, and his first U.S. film was "The Fighting Hope" in 1915. Although he had appeared opposite in several successful features, including Mary Pickford's "M'liss" in 1918, it was "The Miracle Man," which also featured Lon Chaney, in 1919 that solidified his stardom. Cecil B. DeMille used him in such pictures as "Male and Female" (1919) opposite Gloria Swanson and Lila Lee, with Swanson and Bebe Daniels in "Why Change Your Wife?" (1920) and with Leatrice Joy in "Manslaughter" (1922). Meighan continued to be a successful star throughout the twenties with such films as "The Alaskan" (1924), "Tin Gods" (1926), "The Canadian" (1926), "The Racket" (1928) which was one of three films nominated for the first Best Picture Oscar, and "The Mating Call" (1928). 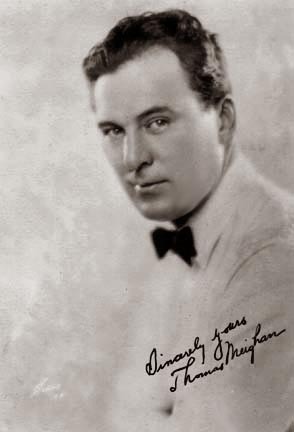 When he made his first talkie in 1928, "The Argyle Case," Meighan was nearly 50 years old and feared his movie days were over, so he went into real estate. However, he did return to pictures in 1931, but only made five talkies before succumbing to cancer in 1936. His career spanned approximately 81 films. He and Ring had remained married until his death. They had no children.